LOCKPORT, NEW YORK (August 10, 2015) — I know, such a cliché image, but you know it had to happen on this trip. This morning Andrej Ernst and I packed up 78 pounds of bryozoan-rich Silurian rocks and mailed them to Kiel, Germany. (Thank you to the kind and patient people at both UPS and the USPS.) 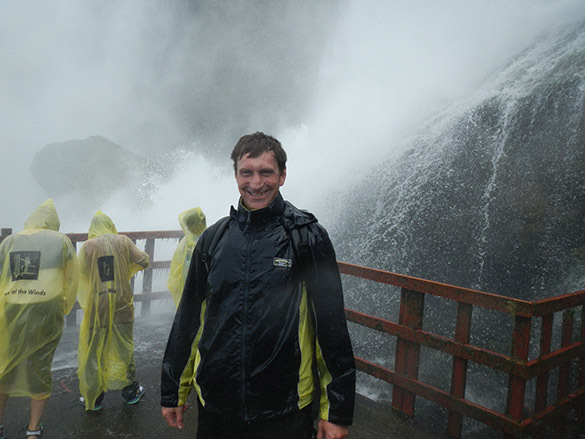 We celebrated our success with a trip to Niagara Falls. Above is the view of American Falls from Prospect Point. 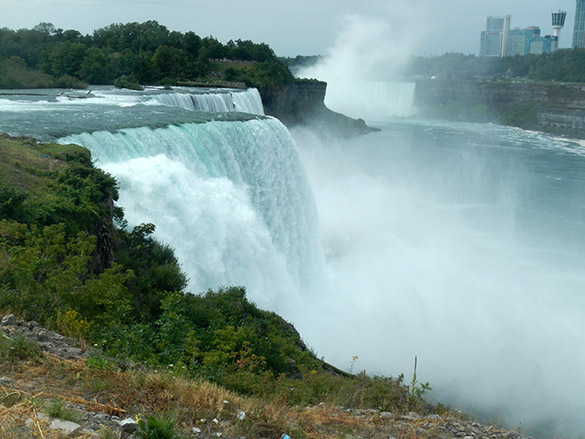 I can’t recommend going to Niagara Falls at the height of the season, especially since the parking system seems to be in disarray and run by 14-year-old boys, and the lines are like Disneyland on the Fourth of July. Nevertheless, there is no way I’m going to let the German visitor spend a week in Niagara County and not see the main attraction. Yellow plastic ponchos and sandals are for the regular public, not geologists. 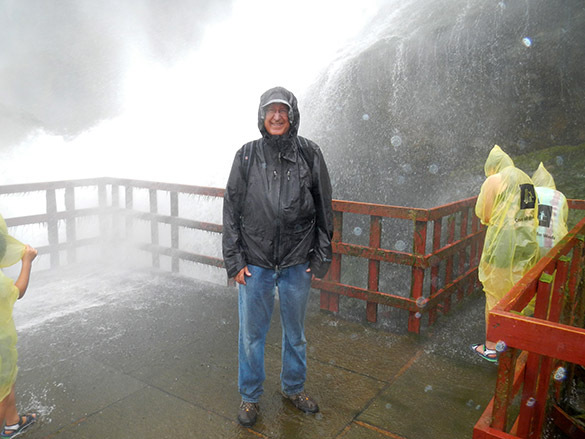 Andrej is very pleased to intimately meet the water pouring over the falls. We tried not to remember that it all flows from Lake Erie. Tomorrow I take Andrej to a Buffalo hotel where he will wait until his flight back home to Germany. I then make the long drive back home to Wooster. A successful end to my 2015 field season. Lots of ideas now for next year! Please use the tag NY2015 for a link to all the posts on this trip. 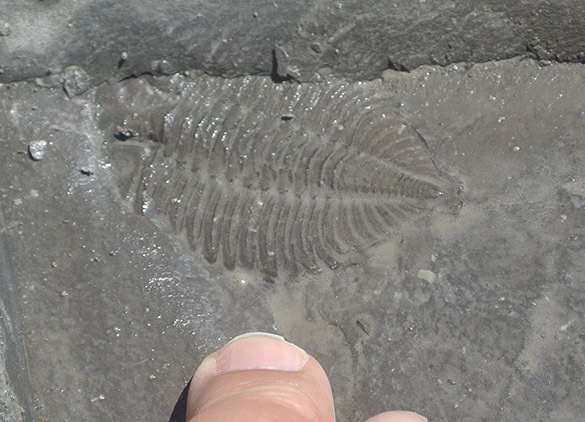 LOCKPORT, NEW YORK (August 8, 2015) — Andrej and I began some deep collecting of Silurian localities in the Lockport area today in our survey of the bryozoan and sclerobiont faunas. 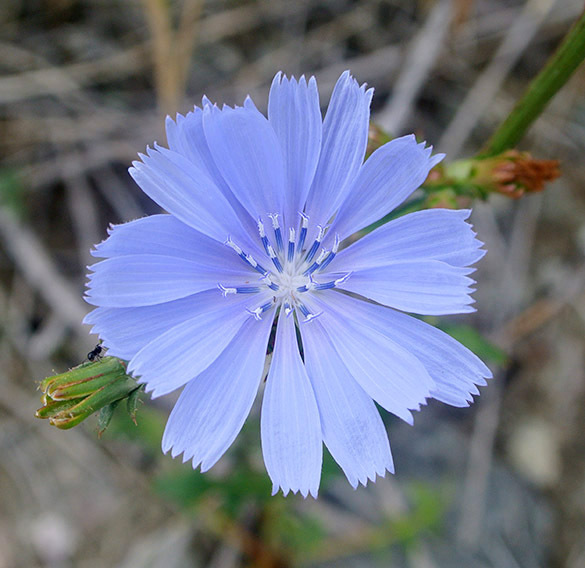 The sites are, shall we say, not the most attractive, so let’s start with this common but gorgeous flower along the roadsides in western New York: Cichorium intybus (chicory). It is an invasive perennial from Europe that now has a global distribution. It has its uses as a coffee substitute, livestock feed, and salad stock. I love the color and serrated petals. And here is why we lead with a flower. 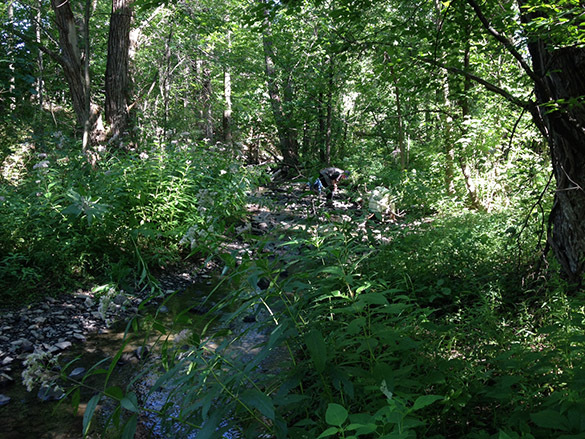 Andrej Ernst is sorting through samples from the Hickory Corners locality on State Route 93 in Lockport. 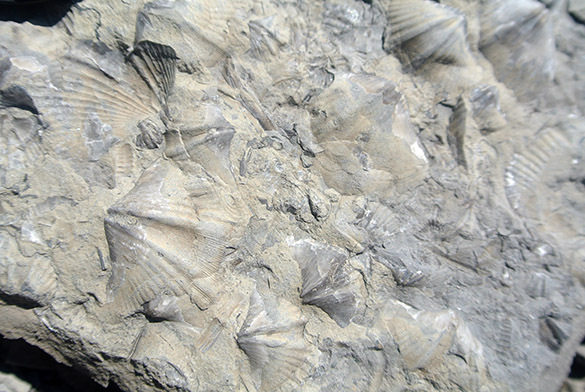 The fossiliferous limestone here is the Hickory Corners Member of the Reynales Formation (Lower Silurian, Aeronian). The bryozoans are wonderfully diverse, and the top of the unit is a bored carbonate hardground. We happily collected here most of the morning, despite the trash and traffic. 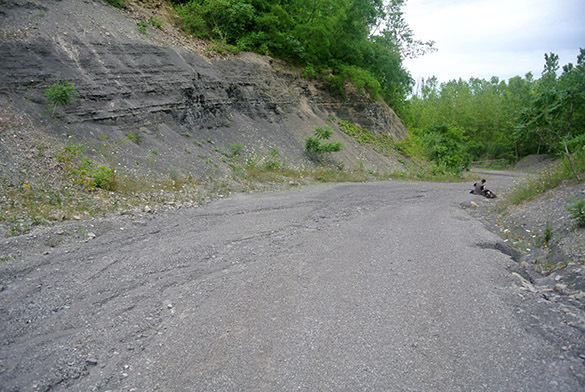 We returned to a site along railroad tracks at Niagara Street in Lockport to collect from the Lewiston Member, part B, of the Rochester Shale. Again, the bryozoans here are fantastic, including my new favorite, a delicate cyclostome named Diploclema. Our last site of the day was along the entrance road to a quarry. With all the surrounding rock, the only fossiliferous horizon is exposed in a shallow drainage cut in the road itself. 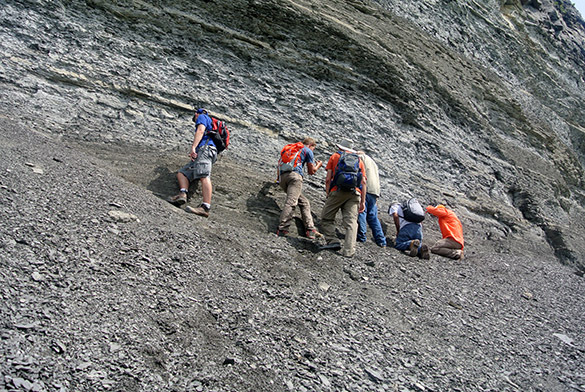 Andrej is pulling a few bryozoans from the top of Lewiston Member, part E, of the Rochester Shale. The thick shales above him are the Burleigh Hill Formation. 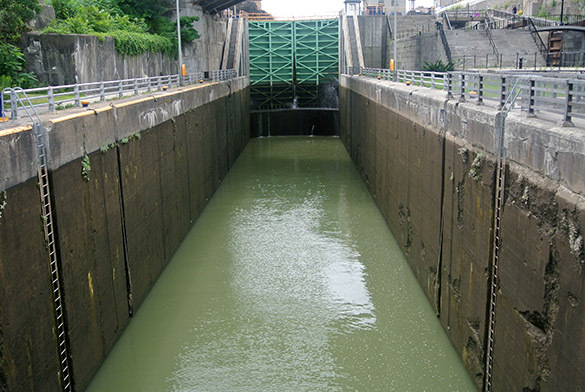 When our work was done for the day, we became tourists and visited the Erie Canal locks in Lockport. (Hence the name!) 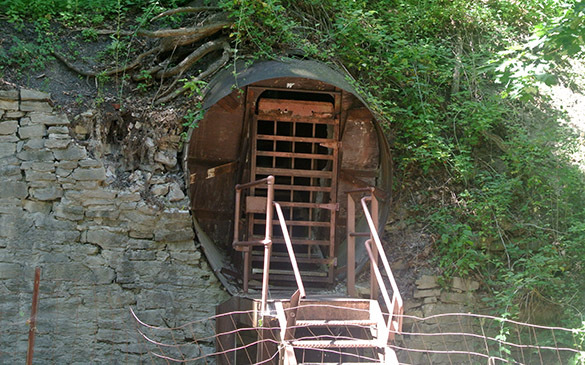 This is a view looking east from the bottom of the two-lock sequence. We wanted to see the locks actually transport a boat, but it was a slow Saturday afternoon. 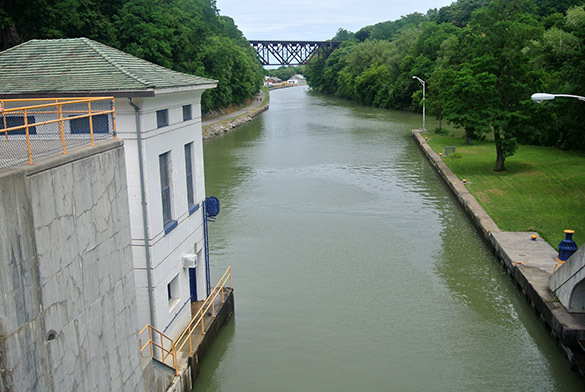 A view of the massive doors upstream of one of the modern locks. The engineering feats here date back to the early 1820s. Geology is evident here too. 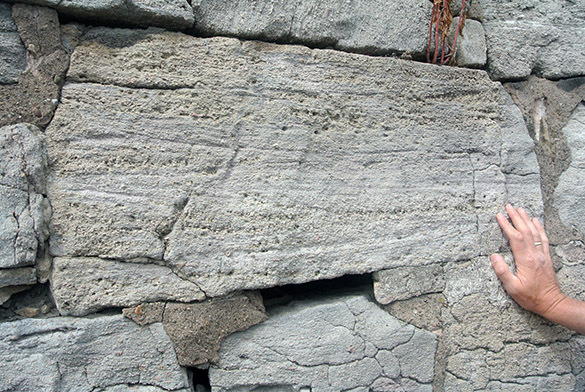 This is a block of crinoidal limestone showing cross-stratification. 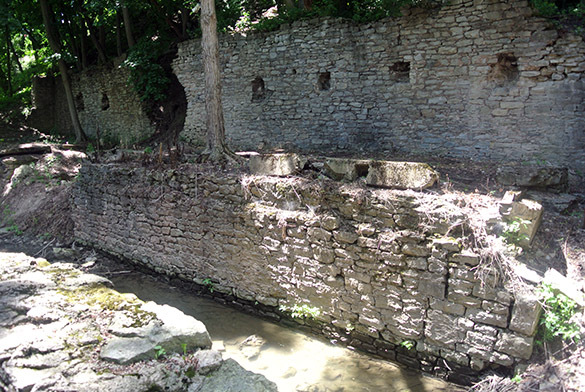 Many of the older buildings in Lockport are made of Silurian stone excavated to create the Erie Canal. 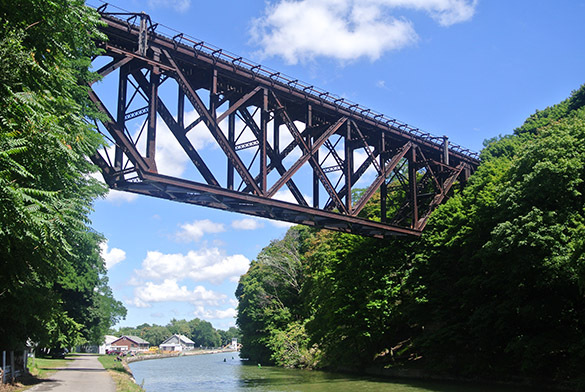 LOCKPORT, NEW YORK (August 6, 2015) — It holds one of the strongest river currents in the world, the gorge of the Niagara River below Niagara Falls. That tremendous flow has cut a deep canyon through the Silurian rocks of the region, providing a superb opportunity for geologists to see the local stratigraphy and paleontology. 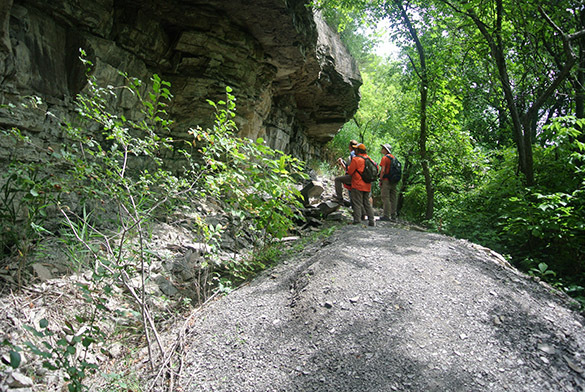 Today our team walked into the gorge from Lewiston, New York, to explore the section. Carl Brett was our guide. 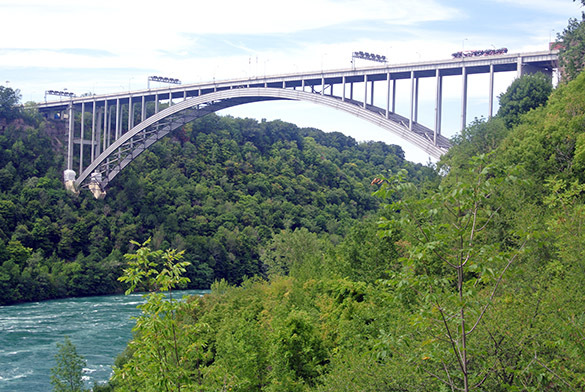 Above is a view of the gorge at the Lewiston-Queenston Bridge that joins the USA on the right with Canada on the left. The forests are plenty dense, but there are rocks in those steep walls. We hiked along the Gorge Trail on the USA side upriver from Lewiston. 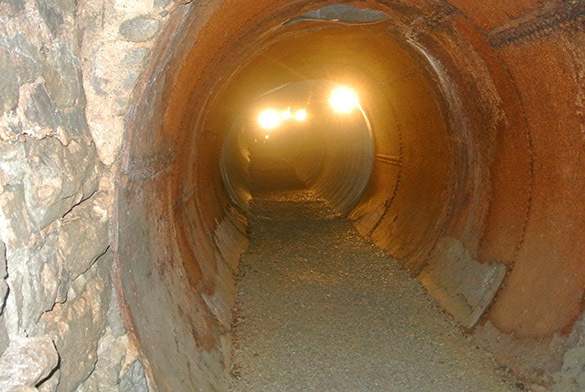 The trail is actually an old road built for transport of construction materials used for the hydroelectric dams upriver. 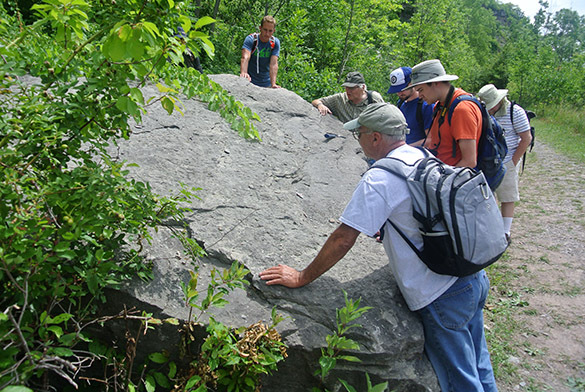 We learned most of the geological context by examining fallen blocks along the trail. This was an interesting way to see the stratigraphy because the different formations dropped blocks randomly along the path. I tried to get a surreptitious picture of my German colleague Andrej Ernst. 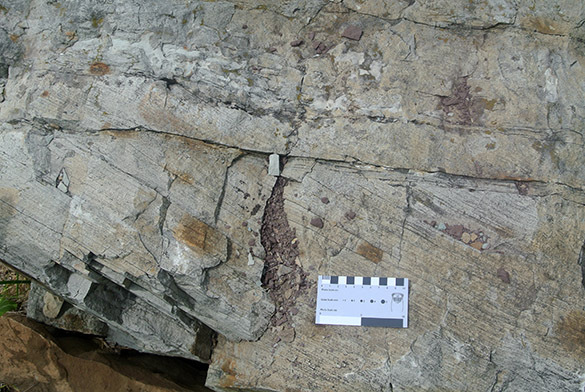 The Grimsby Formation (Lower Silurian, Llandoverian) is a sandstone that has numerous sedimentary structures, including nice cross-sets. 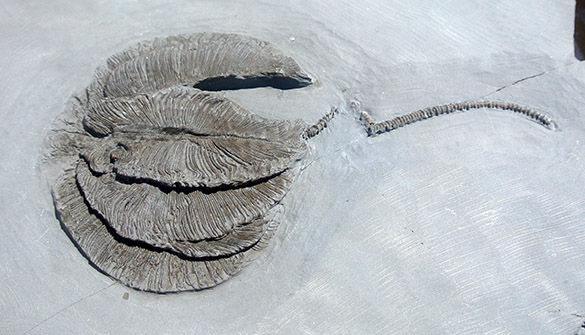 Andrej found this nice specimen of an enigmatic feature called Kinneyia. 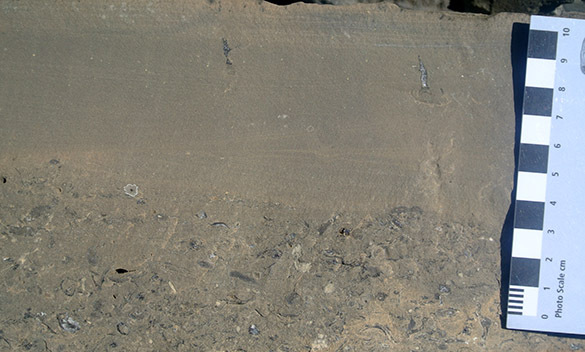 It may be a function of gas build-up underneath microbial mats on the ancient seafloor. I’ve always called it “elephant skin”. A view of the gorge wall above us. 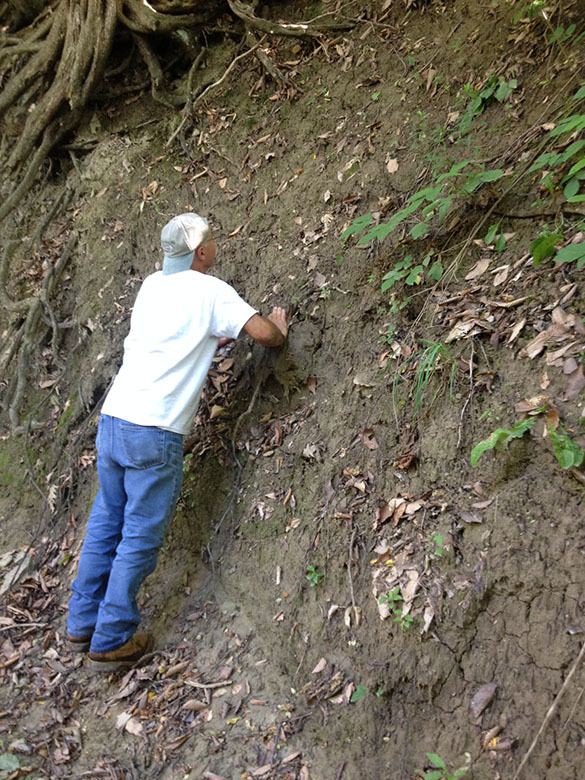 When the trail reached the Rochester Shale, we spent some time searching it for fossils. The most common finds were cystoids (especially Caryocrinites) and the odd coronoid Stephanocrinus. 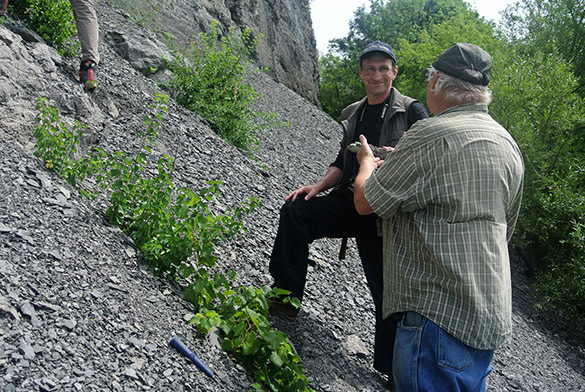 Andrej Ernst and Carl Brett on the Rochester Shale outcrop in the Niagara Gorge. 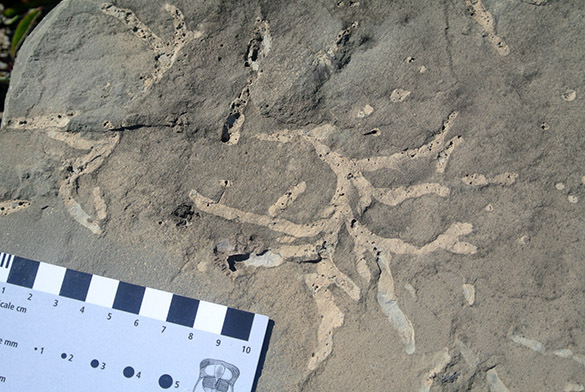 Andrej noted many neglected bryozoans in the fossil fauna exposed here. 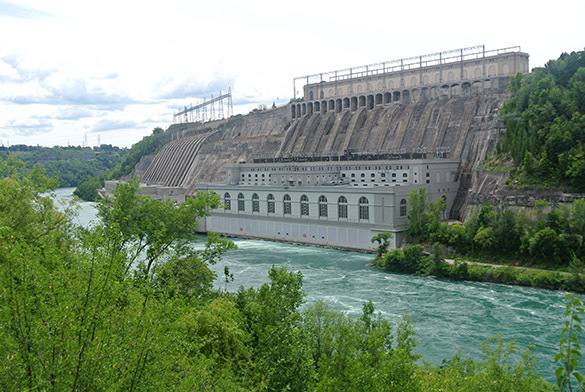 Our final stop was opposite the Sir Adam Beck Hydroelectric Generating Stations built on the Canadian side of the gorge. It is an awesome feat of engineering, and a prodigious amount of concrete. We had an excellent time in the Niagara Gorge. I was at last able to see some of the nuances of Silurian stratigraphy that Carl Brett was explaining. As you can see, the weather was ideal. We said goodbye to Carl at the end of the day as he departed for fieldwork in nearby southern Ontario. 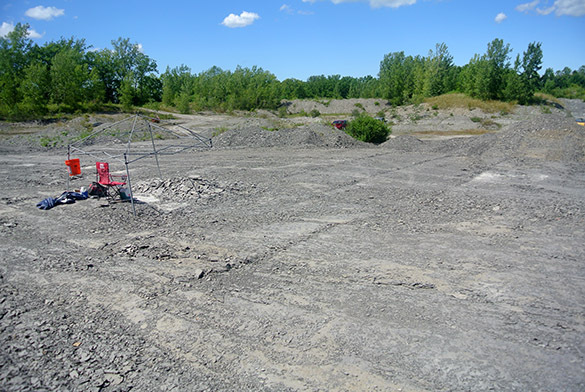 LOCKPORT, NEW YORK (August 5, 2015) — What looks like an ordinary commercial quarry above is actually quite unusual. 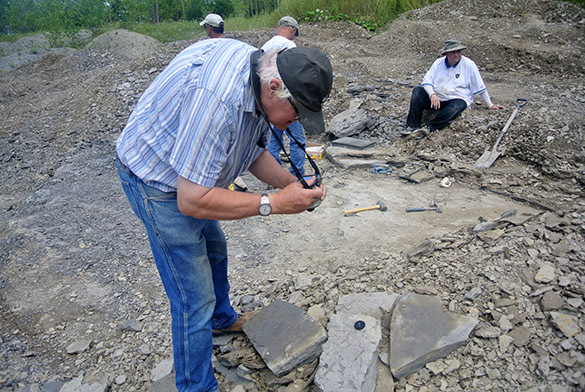 It is an excavation done entirely by amateur paleontologists (“citizen scientists”) to collect and preserve fossils from the Rochester Shale (Upper Silurian, Wenlockian). 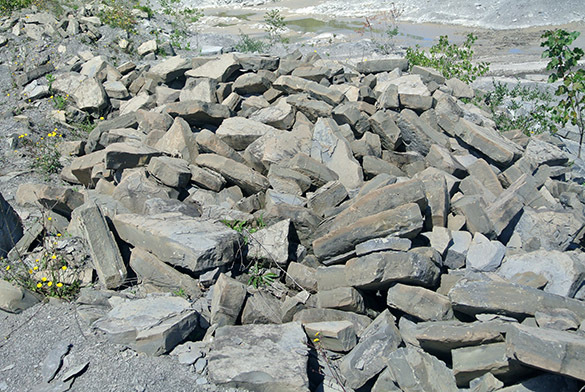 The story of Caleb’s Quarry is well told in the linked American Museum of Natural History article. 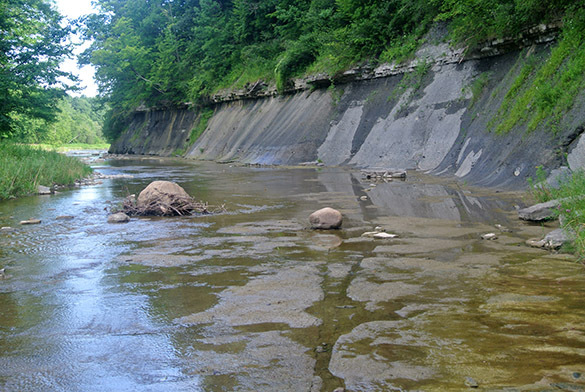 It is near Lockport, New York, and one of the most famous fossil sites in the region. I’m lucky to be here. 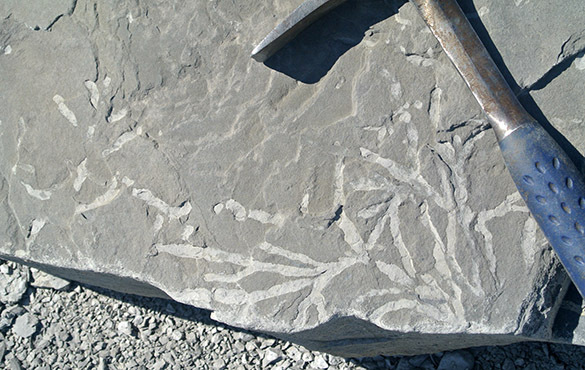 This late summer expedition to New York is to help my German friend Andrej Ernst (University of Hamburg/University of Kiel) collect bryozoans from the Rochester Shale. This bryofauna is inadequately described for phylogenetic and biogeographic analyses, so Andrej has a grant to do the deed from outcrop sampling to preparation, analysis and publication. While assisting Andrej, I am also scouting out new localities for future geology Senior Independent Study projects at Wooster. 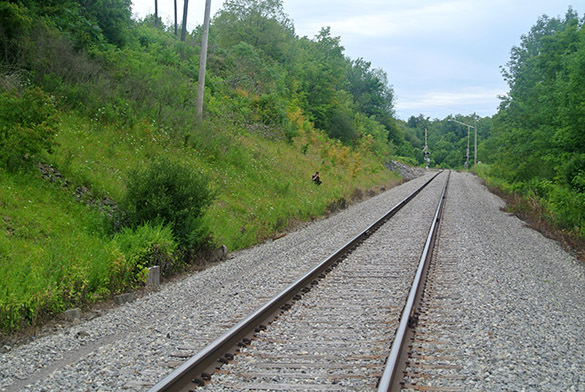 We will be in Niagara and Erie Counties for a week doing this work. Absolutely critical to the project is the field advice and direction of Carl Brett (University of Cincinnati). Carl is without peer when it comes to many paleontological and geological topics, but for the Silurian of New York he is one of the gods. 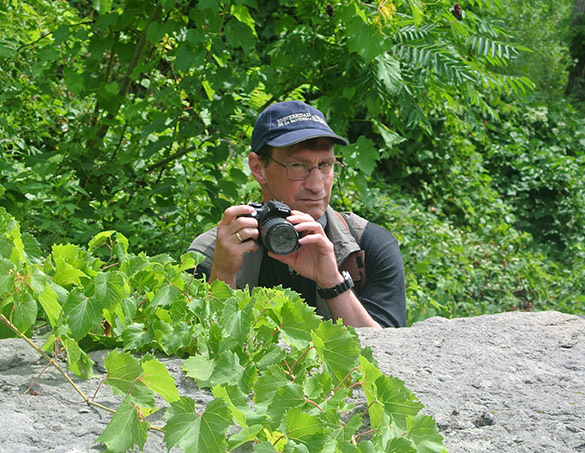 Carl grew up in the region and has been studying the rocks and fossils since he was a young teenager. He gave us two days of magnificent stratigraphic instruction, and he introduced us to the amateur team digging at Caleb’s Quarry. We were also joined for three days by Brian Bade, a citizen scientist from Ohio with an extraordinary passion for fossils, along with deep knowledge and appreciation for how science works. 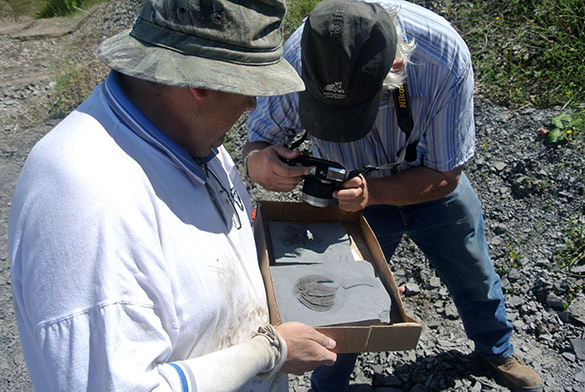 Fred Barber, one of the excavators at Caleb’s Quarry, is here showing Carl Brett magnificent crinoids collected from this locality. 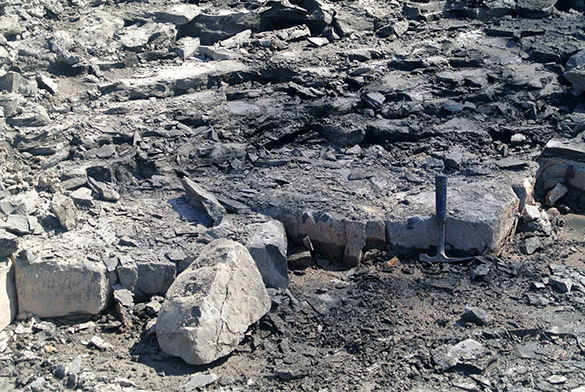 The gray shale matrix is homogenous and soft enough to be removed from the fossil by an expert preparator. 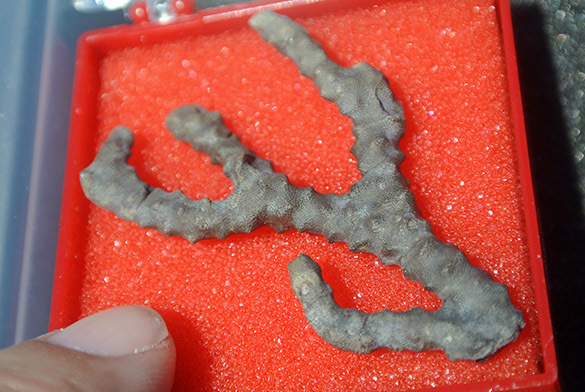 This crinoid shows outstanding preservation down to the pinnules on its arms. Of course, Andrej and I are most interested in the bryozoans from Caleb’s Quarry. Here is a beautiful specimen that has been carefully reconstructed. I found these brachiopod-rich beds intriguing. Striispirifer is a new name to me. 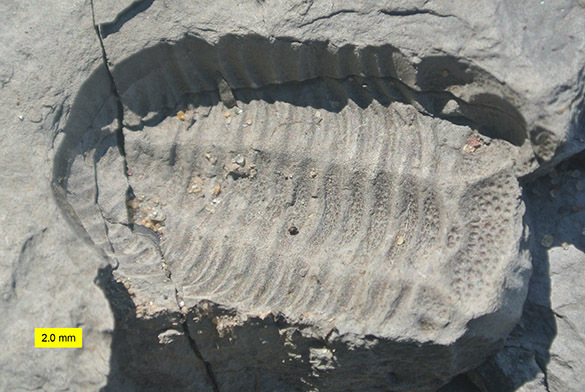 Trilobites are always the stars of Paleozoic fossil sites like this. While we were at the quarry we watched one of the excavators (Kent Smith) unearth this gorgeous specimen. I believe it is Dalmanites limulurus. 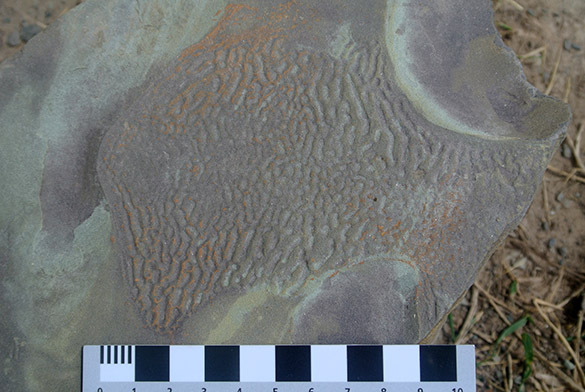 The trace fossils here are very interesting. There may be project possibilities with this ichnofauna because of the diversity present at the quarry and the bedding plane exposures. This is the trace fossil Chondrites. After our quarry visit today we then stopped at some other exposures of the Rochester Shale. This scene shows what fieldwork is like without quarries and roadcuts! We are here along a tributary of Jeddo Creek, at the top of Lewiston Member B of the Rochester Shale. Hard to tell, eh? 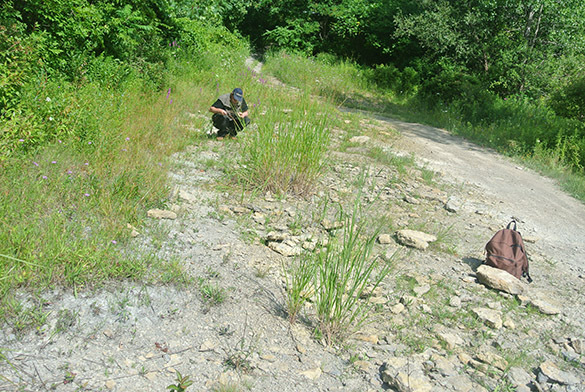 Here Brian Bade is examining a deeply weathered section along the creek. 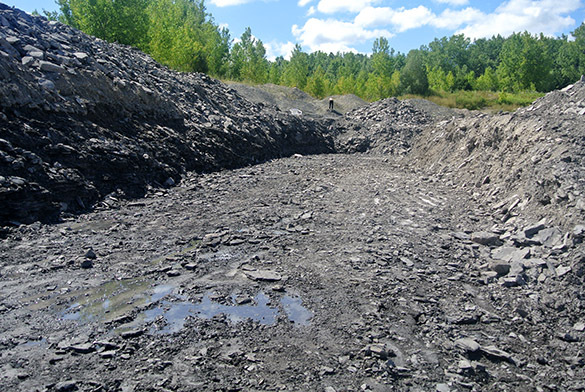 Years ago Carl Brett took advantage of this disaggregation of the Rochester Shale to sieve the sediment for small fossils. He has generously given us the “washings” from this cut, which represent months of his work as a graduate student. They are loaded with tiny bryozoan bits, along with many other taxa. 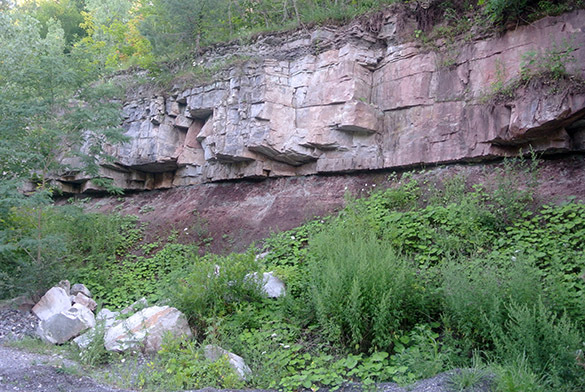 We ended the day with a look at several other outcrops in the Lockport area. 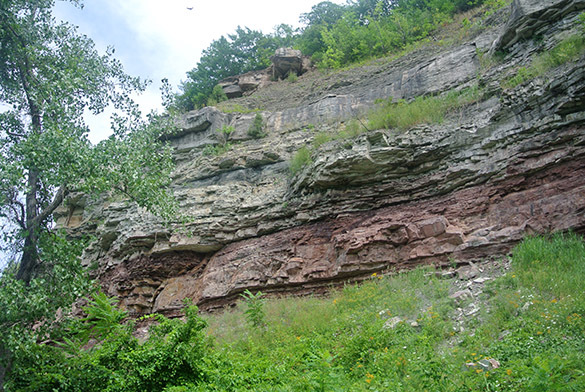 The impressive contact here between the massive sandstone and the underlying red shales is called the Cherokee Unconformity. It is a megasequence boundary correlated across most of North America. It was thought until recently to be the Ordovician-Silurian boundary, but now all you see in this image is considered latest Ordovician.